This is a simple quick project perfect for Mother’s Day or any other occasion. I had some pieces of upholstery webbing left over from an upholstery project (coming soon) and decided to try and use the webbing for an idea I had. (Can’t just throw anything away that I might use for something) If you don’t have any it is very inexpensive at fabric stores and sold by the yard. Measure your webbing to determine what size container to buy. I went to the thrift store to find jars suitable for my idea. The jars needed to be straight up and down where the webbing was to be placed. The containers could be jars, vases, glasses, or any container. You could even use a box for this project. I particularly like the square jar. 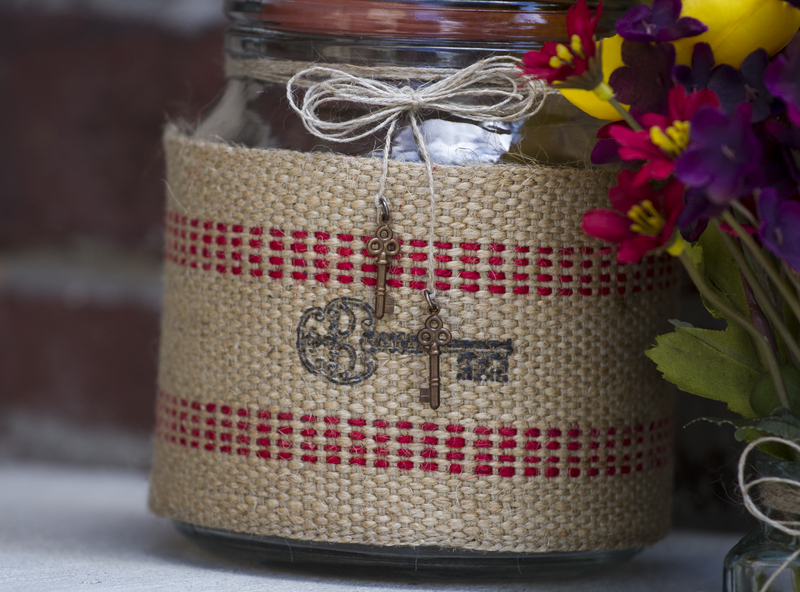 The cost for the three jars was $2.00 and I had everything else leftover from other projects. 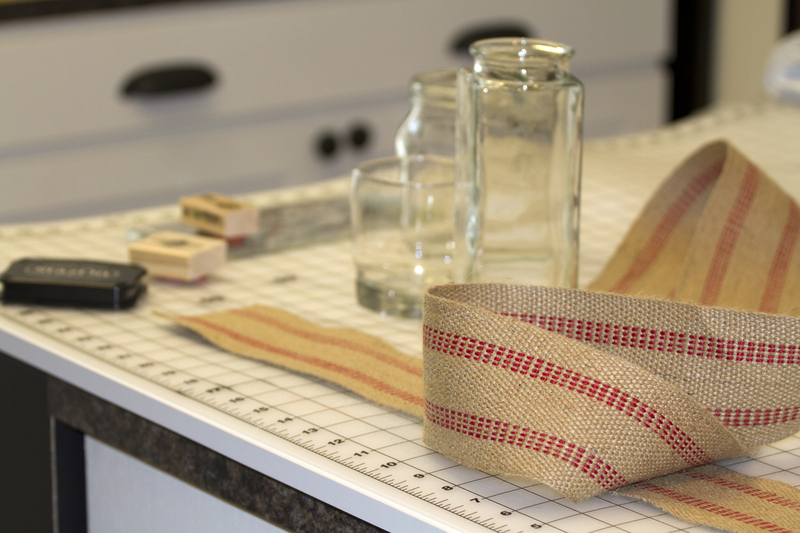 I washed the jars and measured the webbing around each jar. I added a little for a seam allowance and then folded the webbing in half and finger pressed it to determine the center. Then stamp the center of the webbing with a stamp of your choice. I used a StazOn black stamp pad. 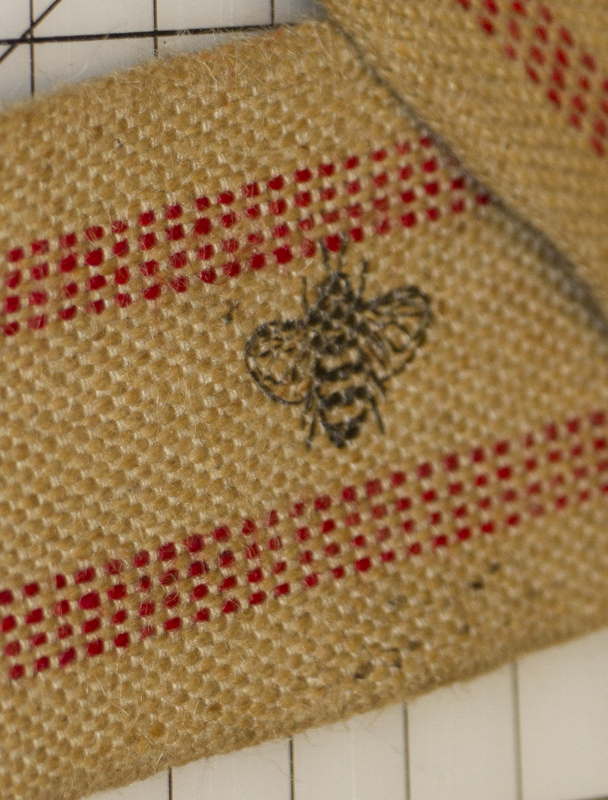 I wanted the images to fit inside the red stitching on the webbing. The webbing could also be cross stitched or embroidered for a fun look also. Another idea is to fasten an old jewelry pin/brooch on the webbing adding some bling to your jar. 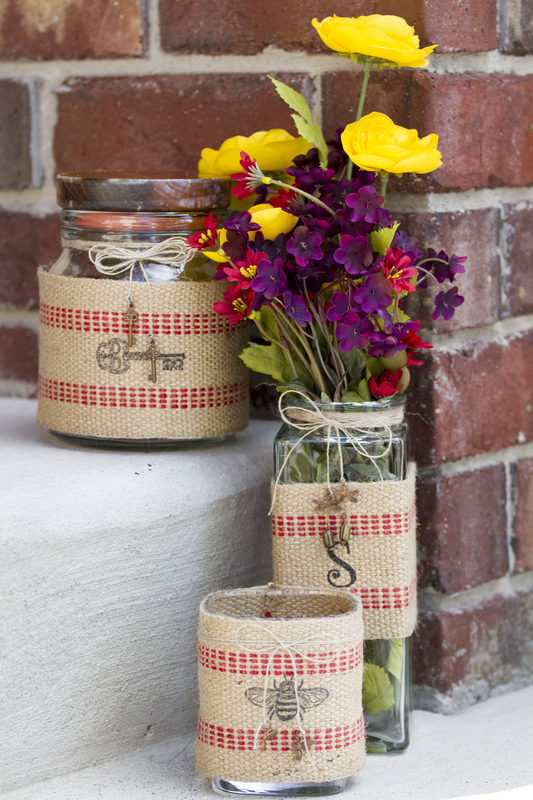 Burlap ribbon or other fabric/ribbons would look great also. Then I put right sides together and sewed the seam to make a circle. Finger press the seam open, turn right side out, and make sure the fit is tight on your jar. If you aren’t good at judging the seam allowance just baste it first so it can be ripped out easily if the fit isn’t right. You could glue the webbing on but I wanted the option of removing it. Glue dots would work if you don’t have a glue gun. You can find glue dots in the scrap booking section of craft stores. 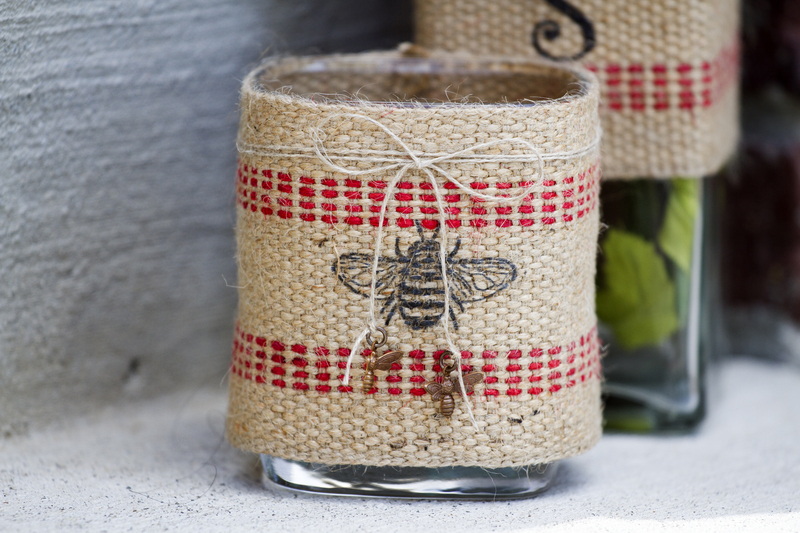 Slip the circle of webbing on your jar and embellish your jar further as you prefer. I used jewelry findings from Vintaj for my jars. Fill with flowers, candy, small gifts, or anything you like. If you are a candle maker you could use this container for one of your candles. 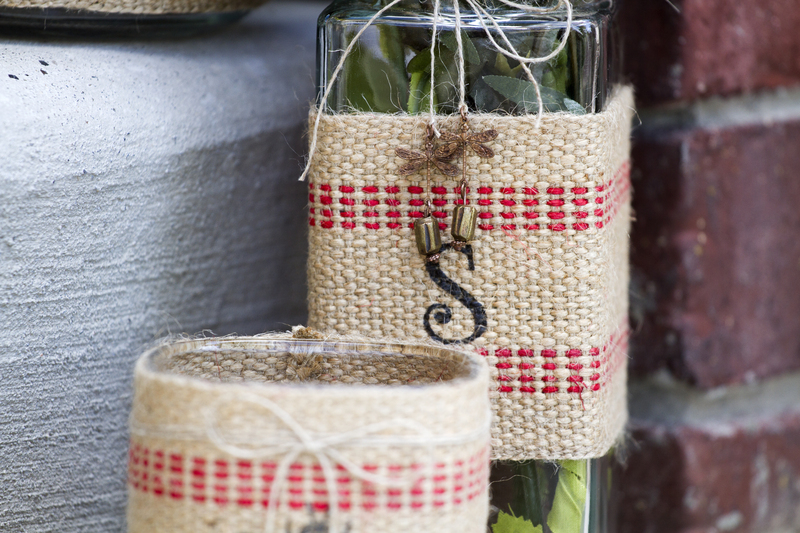 The jars could be personalized for each recipient and would also make a fun way to welcome a new neighbor. These can easily work with a Christmas theme and filled with candy canes, Christmas greenery, candy, small gifts, ornaments, or anything that would fit into the container you choose. Keep crafting! 09 May	This entry was published on May 9, 2014 at 11:22 pm. It’s filed under DIY, Holidays at the Cottage, Re-purpose, Re-purpose Gallery, Tutorials and tagged DIY, Gift ideas, jars, Mother's Day, repurposing, stamping, upcycling, upholstery webbing, vases. Bookmark the permalink. Follow any comments here with the RSS feed for this post.